Setting Out was one of apexart's Unsolicited Proposal Program's 2016 winning exhibitions, curated by Shona Kitchen, Aly Ogasian and Jen Dalton Vincent, with graphic design by Gabe Melcher. 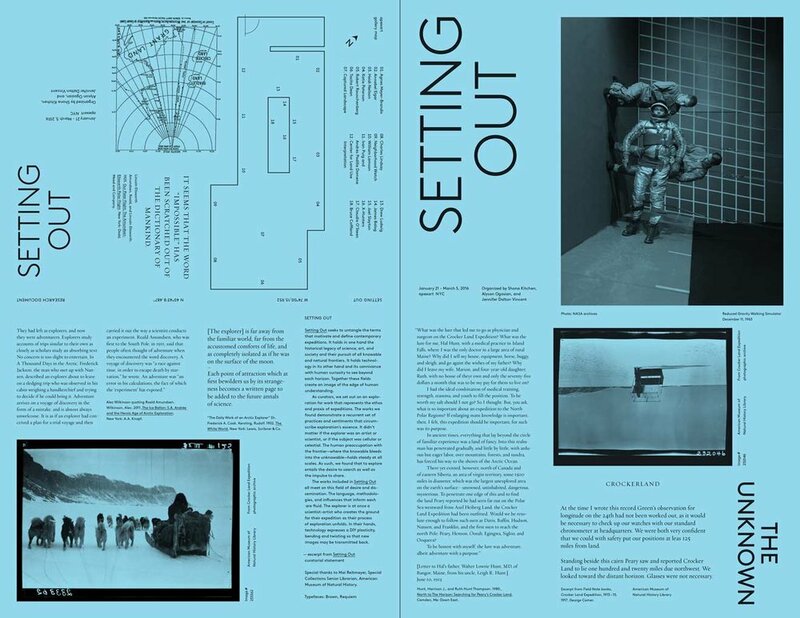 Setting Out seeks to untangle the terms that motivate and define contemporary expeditions. It holds in one hand the historical legacy of science, art, and society and their pursuit of all knowable and natural frontiers. It holds technology in its other hand and its connivance with human curiosity to see beyond each horizon. Together these fields create an image of the edge of human understanding. In its original use, the term expedition implied “setting out with aggressive intent” to procure a “prompt supply” of something desired. Today, the frontiers of contemporary expeditions exceed physical geography. Setting Out asserts that the horizon towards which today’s explorers reach has turned back on itself: it now resides within sociological and technological atmospheres, ones born from the integration of remote viewing technologies into our cultural consciousness. To examine these atmospheres, the work showcased in Setting Out dovetails at the inexhaustible curiosity and desire to bring the human experience into all worlds.